Eureka, CA (July 23, 2018) – The 2018 season at Redwood Acres Raceway is rapidly coming to a close with this Saturday night’s Harper Motors Night at the Races marking four races left on the schedule. While the Compass Community Credit Union roadrunners had the night off, the late models returned to action. 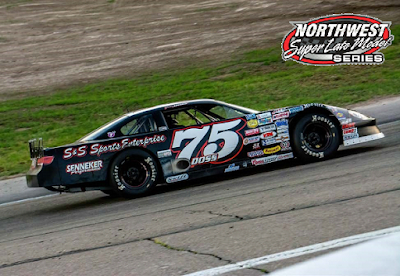 In addition, the North State Modified Series made their second visit to the Acres this season. Lane Anderson has been fast all season in the Bandolero division and continued that by setting the fastest time in qualifying at a 21.354. Ethan Imperatrice made his first start of the season and was able to win the trophy dash and the heat race. Trey Daniels took the lead at the start of the main event and had control of it for the first six circuits. Imperatrice moved to the lead on lap seven before Daniels retook the position. Two laps later, Daniels fell out of the race giving Imperatrice the lead but in another two laps, Imperatrice also fell out. Anderson took over the top spot and was able to lead the rest of the way and score the victory. Maleesa Miles finished second followed by Aiden Kimberling and Kadence Mace. Imperatrice was scored fifth. Qualifying for the Fortuna Wheel & Brake bombers was led by Wyatt Roach with a 18.424. Roach took the dash win while Sam Brown was the heat race winner. Brown used the pole position to his advantage in the feature event as he was able to take over and lead until lap eight. That’s when Roach took over. He was able to hold on and take his first main event win of the season. Brown and Jim Redd finished second and third. In the NorthCoast Lighting And Electric Legends division, Brad Curtice set fast time with an 18.121. Chris Lawrence was the trophy dash victor while Aiden Daniels and Curtice were the heat race winners. The opening lap of the feature was led by David Dunlap. Lap two saw Aiden Daniels move to the front. Curtice quickly sliced his way through the field and moved to the lead on lap eight. The field spread out and Curtice was able to gap Aiden Daniels. At the finish it was Curtice taking the victory by nearly two seconds. Aiden Daniels narrowly beat Lawrence to the line for third. Kylie Daniels finished a strong fourth with Zach Frazer rounding out the top five finishers. The ever-competitive Humboldt Hydroponics mini stocks were paced by Brian Murrell, Sr. as he set a qualifying lap of 18.980. Eugene Palmer crossed the line first in the trophy dash and Brian Murrell, Jr. winning the heat race. Nick Ford held the lead for the first five laps but contact between he and Trevor Eacret allowed Brett Murrell to move to the position. 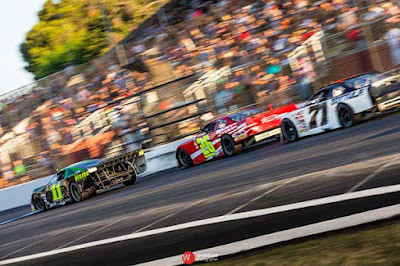 The rest of the event came down to a battle between Brett Murrell, Palmer and Murrell, Sr. As the laps clicked off, Brett Murrell was able to stretch his lead. At the finish line it was Brett Murrell winning. Palmer held off Murrell, Sr. for second while Brian Murrell, Jr. and Scott Taylor finished out the top five drivers. 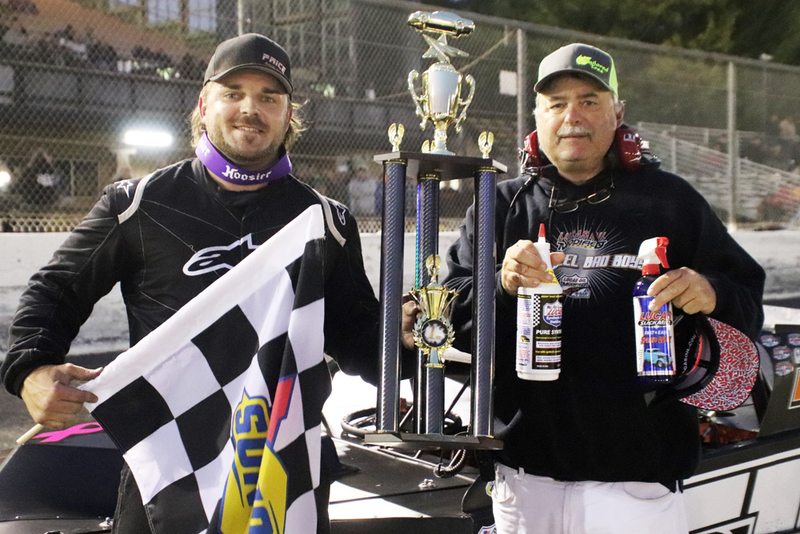 Darrin Sullivan narrowly took fast time for the North State Modified Series setting a 16.548. Herman Pulyer prevailed in the Lucas Oil Dash For Cash. The invert for the 60-lap main event was 10 which put Stuart Campbell on the pole. After falling back to the third position, Eric Johnson was able to move to the lead on lap 10. Kris Price moved his way to second after 15-laps and on lap 19 he took over the race lead. Price was able to slowly pull away from the rest of the pack. Eric Price, Jr. was a favorite going into the event but fell out just before the halfway point. Terry Deal took second from Eric Johnson with 15-laps remaining but was well behind the leader. With three laps remaining, smoke poured from Sullivan’s car taking him out of action and necessitating a caution flag. The field bunched up for a sprint to the finish however Deal was not able to get by Eric Price. At the finish it was Price holding off Deal for the win. Johnson was second ahead of Randy Houston and Dustin DeRosier. Less than 0.056 seconds separated the top three in qualifying for the Mid-City Motor World Super Six Late Model Challenge Series with Mic Moulton setting the fastest lap. George Young was the winner of heat race number one while Luke Hall won heat number two and pole position for the NorthCoast Lighting & Electric main event. Hall jumped to the lead at the start of the feature with Dane Nissen following him into second. David Henderson slotted into third while Moulton held fourth. With nary the sign of a caution flag, handling and tire wear proved to be more important than usual. The halfway point saw Hall still leading Nissen but third place was switched between Moulton and Henderson. The front three closed up on each other. On lap 40, Moulton maneuvered past Nissen and chased Hall for the lead. With 15 to go, Moulton took the lead from Hall. Moulton was able to slowly pull away as the rest proved to be caution-free. Moulton crossed the finish line first over Hall, Nissen and Henderson. Kenny Demello put in a solid fifth place effort. Racing on the 3/8-mile paved oval at Redwood Acres Raceway will take a month-long break as August 18th is the next race on the schedule. Prior to that event, RAR will host the Malicious Monster Truck Insanity Tour on August 3rd and 4th. Tuff trucks will also be in action as well as monster truck rides. Saturday night will be the second boat race at the Acres in 2018. July 21, 2018 Eureka, CA.... 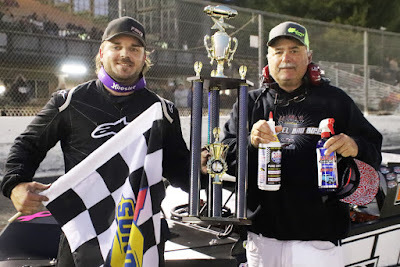 Taking the lead on lap 20 with an inside pass on Eric Johnson of Kelseyville, Kris Price of Sacramento drove the remaining 40 laps flawlessly to collect his third season victory in the Protect the Harvest North State Modified Series at Eureka's Redwood Acres Raceway Saturday night. Price increased his NSMS points lead and now has a 41 point margin over second place Dustin DeRosier of Cloverdale. Kelseyville's Darrin Sullivan earned the $100 WLM&D fast time award with his 16.548 second lap. Sullivan pulled the #10 chip for the inversion putting Stuart Campbell and Johnson in the front row. Stuart and Johnson ran side-by-side the first seven rounds with DeRosier tight on Stuart's bumper, not allowing Johnson to pull back into the low groove. Just as it looked like Johnson was losing ground, his car hooked up, and on lap 12 he passed both DeRosier and Stuart and took over the number one spot. DeRosier also shot around Stuart, but two rounds later Kris Price drove under DeRosier for second and set his sights on Johnson. Price caught Johnson on lap 19, and when he saw an opening down low he filled the gap and drove under Johnson for the lead. Price's brother, Eric Price II developed problems and ended his run on lap 26. Meanwhile both Deal and Houston were picking off cars as Sullivan's car began to smoke. With only three laps to go, Sullivan's engine finally gave out and his car stalled on the track to bring out the only yellow flag in the race. Pulyer was the $100 winner in the Lucas Oil Dash for Cash. Johnson finished second and donated his $50 to the North State Modified Series Driving Our Cancer Fund. Both Pulyer and Johnson also received the Scribner Plastics jugs. Avila took home the Naake Shocks certificate, and the Frank's Radios awards were given to Young, Pulyer and Mosher. The North State Modified Series is presented by: Protect the Harvest, Lucas Oil, Ward Land Management & Development, Hoosier Tire West, Sunoco Race Fuels, Naake Suspension, Five Star Bodies, Racer Bling, Keyser Racing Products, Scribner Plastics and Frank's Radios. The Pacific Challenge Series is presented by: Penney Racing Supply, Penney & Associates, American Racer Tires, Radio Law Talk, Compact-It, Northwest Compactors, Naake Suspension, Sunoco Fuels, Five Star Bodies, BrakeOMeter, Lefthander Chassis, ARP Bodies, Joes Racing Products, Competition Carburetion, Bassett Wheels, Frank's Radio, WrapStar Pro, and Blakesley Sports Media. 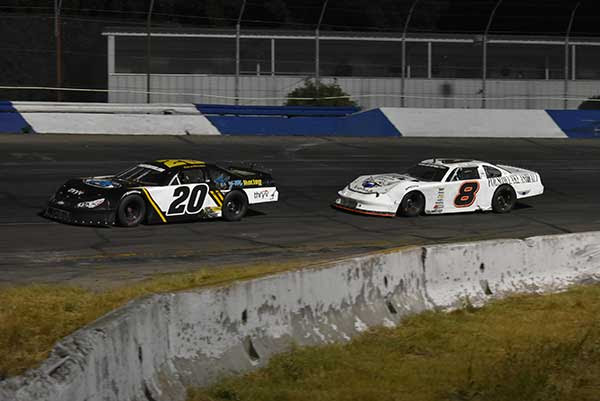 All PCS Super Late Models race ABC Bodies or Muscle Car bodies on American Racer Tires with Sunoco Racing Fuel.